Thanksgiving is a time to reflect on what the year has given to us to be thankful for, a time to gather around the table with friends and families, and make new memories that we’ll cherish. This is not altogether unlike a meal at Walt Disney World, particularly one where friends come to visit your table, marvel at the good things piled high on your plate, and when they just so happen to be having a Friendship Day Celebration (or rather, Celebrashun). 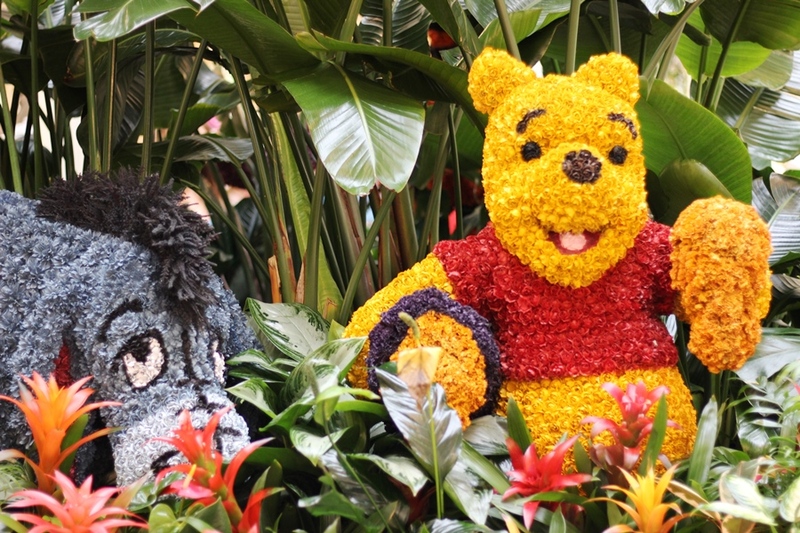 If you’re still lost, we’ve ventured over to the Crystal Palace to visit with Pooh, Tigger, Piglet, and Eeyore, while enjoying a smorgasbord filled with all the best offerings from the Hundred-Acre Wood. Since not all buffets are alike, let’s start with the setting at the Crystal Palace. Based upon the original Crystal Palace in London’s Hyde Park, you can see how the structure would have been a marvel during the Great Exhibition of 1851. Even the Magic Kingdom version is filled with ornate iron and glass which transports guests back in time and gives the whole restaurant a sense of elegance. Juxtaposed against this opulence are the childish qualities associated with Christopher Robin’s animated friends, a charmingly misspelled banner, and even topiaries of Pooh and company. It is altogether a wonderful mishmash of fun and sophistication. 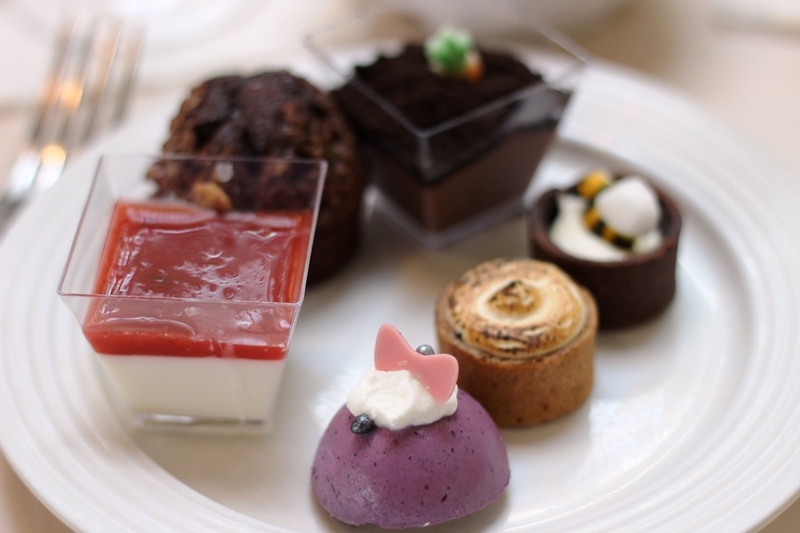 This trend continues onto the menu, where just about any and everything you would want from a buffet is provided. In fact, playing into this week’s festivities, I was able to put together one plate that was all Thanksgiving and included turkey, stuffing, gravy, rolls, green beans, collard greens, carrots, and mashed potatoes. It may not be specifically what we’ll have at my house tomorrow, but it was a fine stand in. 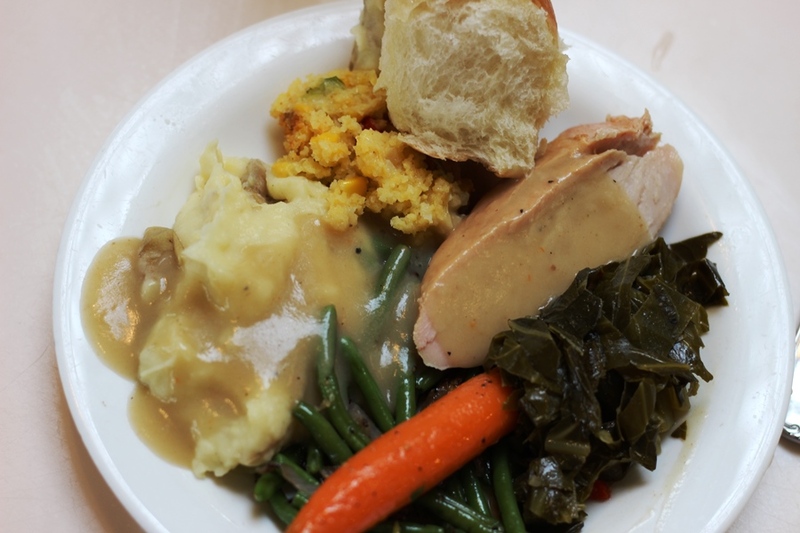 Other options include a wealth of salads, pastas, seafood, sausages, a ton of vegetable offerings, and several meat options from the carving station. Beyond how vast the selection was, I was shocked by how many healthy options there were. Not only the quantity, but that the vegetable and salad options were things that I wanted to eat, and not just healthy options that had been thrown together for the sake of having healthier options. The cucumber salad and whole carrots were favorites of mine, while my wife gravitated more towards the couscous and other salads. Of course, being with a bear with a rumbly in his tumbly, means that there are also going to be something sweet to eat as well. Ice cream with all the fixin’s is available, but don’t overlook the dessert spread. Small s’mores tarts, honey tarts (complete with candy bees), panna cotta, dirt mousse, and fruit filled domes are just a few of the offerings here that you’re going to want to save room for. The last meal I had at the Crystal Palace was a little more than a decade ago, and at that time I swore off the place for good. However, giving it another chance recently was one of my better decisions. I went into this meal expecting to eat very little and come out hungry and looking for something else to eat, and I was entirely shocked by the wonderful meal I was able to have. Yes, it is a buffet, but there is a quality to the menu items that is a step above what the term buffet usually means to all of us that surprised me. If you’re like me, I highly suggest you give the Crystal Palace another chance, or a first chance, if you’ve never tried it. The atmosphere is great, the food is delicious, and the friends are wonderfully warm. I guarantee you if the food doesn’t have you leaving the restaurant with a smile on your face, your interaction with the silly old bear will!